For visually impaired people, traditional books cannot be used to learn. So, they use Braille, a tactile writing/reading system that can be deciphered with the reader’s fingers. Sadly, in the developing countries such as India, Braille technology is quite expensive, meaning that some of the 22 million visually impaired people living there have to carry a social stigma all the way through adulthood. In the absence of education, many of blind people can’t find a job, end up illiterate, or with low socio-economic status. Serviceplan Health & Life, L V Prasad Eye Institute in India (LVPEI), and leading educational toy company Ravensburger sat together at a table and engaged in a series of discussions during which they tried to find an accessible solution for everyone. The brainstorming sessions ended successfully, as they identified a new affordable, and fun approach that is intended to provide all of these people with a chance to become more independent. 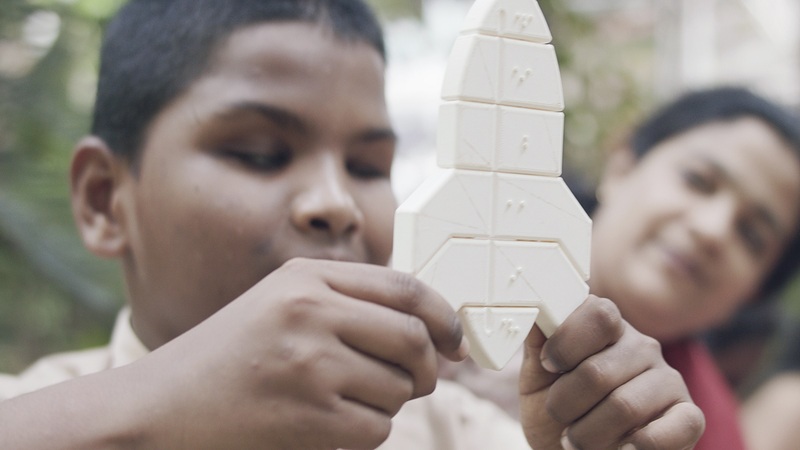 Their brainchild is named Fittle, an innovative project that relies on 3D printing technology to manufacture affordable Braille puzzles which help kids suffering from this disability to learn and read more efficiently. The world’s first 3D-printed Braille puzzle translates as a new set of toys which covers the entire alphabet. Each puzzle divides into equal parts that, when combined, form a word and shape of the object the kids are assembling. 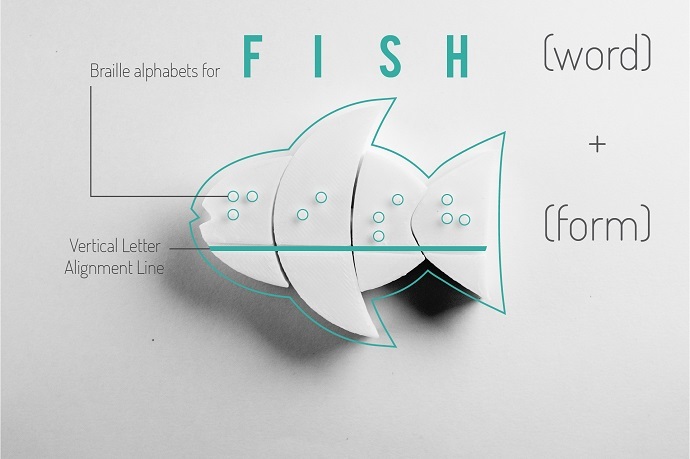 A line at the bottom of the puzzle features various-shaped connectors and allows children to make the right combinations while learning how to correctly spell words—such as rocket, mouse, fish, key, boat, violin, crown, and many others—in Braille. The Fittle models, which were imagined by designer Tania Jain of the National Institute of Design in Gandhinagar, India, can be downloaded for free from the project’s website. Inspired by the “learning through play” concept, the team behind the project wants to boost kids’ creativity while inviting them to discover the beauty of learning in a fun and original way. Without their usual obstacles. Moreover, the online portal doubles as a communication tool that LVPEI uses to kindly ask users to financially contribute to the initiative. Donations are directed towards the healthcare institution, which will use the money to buy 3D printers and other useful materials to schools dedicated to blind and visually impaired kids in India. Normally, $10,000 dollars would be just enough to help four digital Braille readers. Or the money could be used to provide 200 Braille Books. 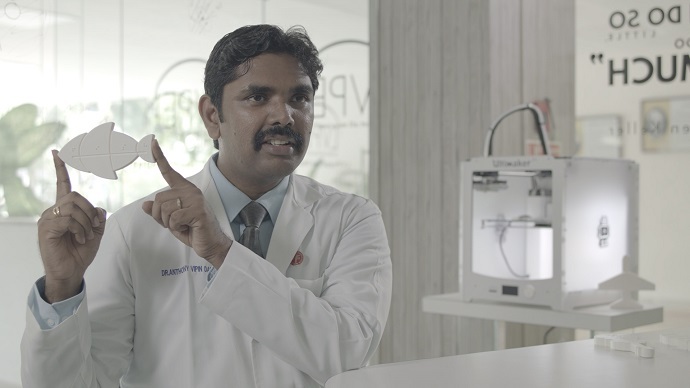 In the hands of the health institution’s team, the same amount of money can be used to supply a school with a 3D Ultimaker printer, which can produce up to 16,000 Fittle puzzles, with 12 models covering the alphabet. So far, the donated 3D printers have given birth to around 50 puzzles per day. But LVPEI doesn’t stop there: the institution hopes to make the initiative much more visible so that it can help blind kids all over the globe, not just those in India. The project is also supported by the “Sound of Fittle” app, which should use the phone’s camera to scan the puzzle model. Once the phone recognizes the object, the gadget plays a sound characteristic to the scanned model. At least, this is what the app’s video description states. After installing the app, we noticed that the sounds can be enabled without the phone’s camera. The app features only a list of five type of sounds, and although is pretty ‘primitive,’ it can surely help kids learn more effectively. Simultaneously, a Fittle film created by ServicePlan will be screened in movie theatres in India. Managed by the Prasads group, India’s largest chain of post-production facilities, the video will be distributed all over the country with the goal of raising awareness about the educational aspect of the 3D Braille Puzzles and helping engage more people within the project. “Fittle combines state of the art technology with a creative product idea to make a difference in the lives of many children around the world. To be part of this project is really exciting for me,” says Serviceplan Health & Life’s Creative Director, Christoph Bohlender. Maybe you could start helping too, just share the article, or the full campaign?